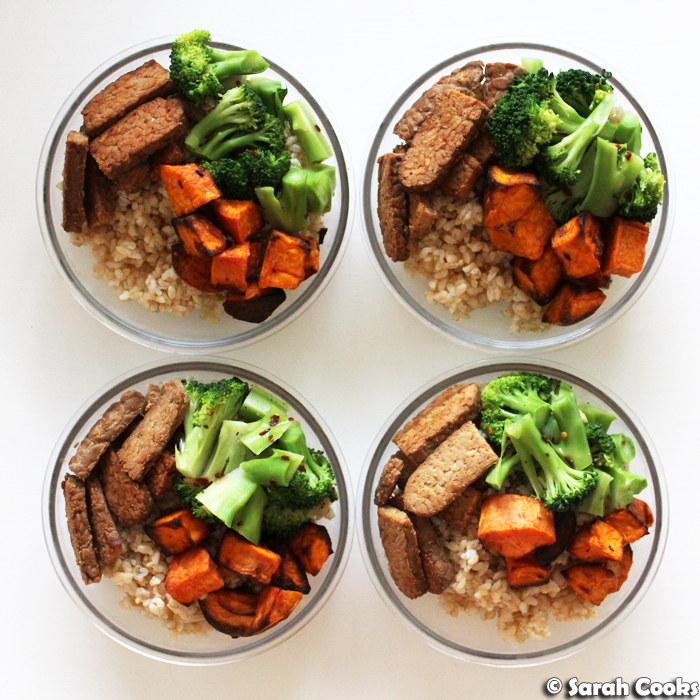 For today's meal prep, we're channeling Sarah in the early 2000's with a vegan bowl! I've always been a committed omnivore, but back when I was in uni, I was super into vegetarian food. I would often visit Shakahari, Tofu Shop, and the Co-Op at Melbourne Uni for that particular type of hearty hippie food - brown rice, dense spelt rolls, vegetables, tofu, tempeh, miso, and tahini. So much tahini. 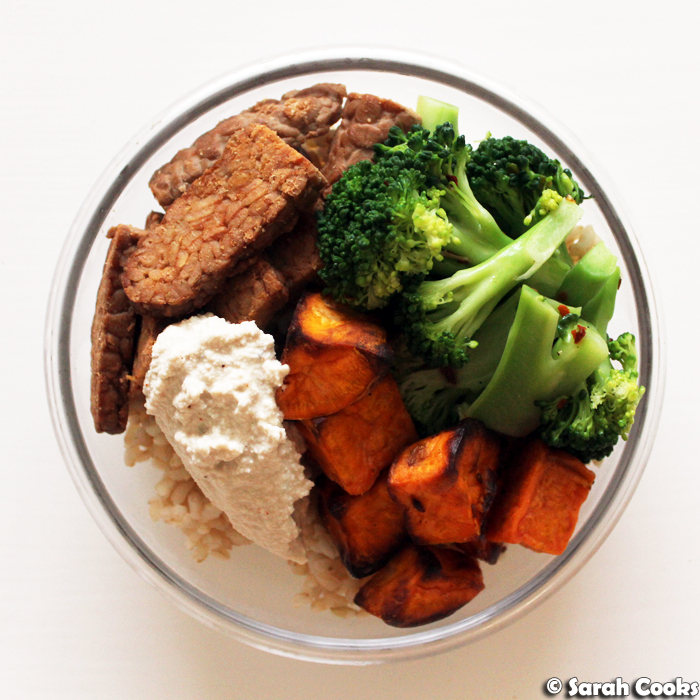 We start with a base of brown rice, and top it with cumin-roast sweet potato, broccoli with chilli, fried tempeh, and zingy cashew cream. We've got your protein, your fibre, healthy fats and your greens! Let's do this thing. So, tempeh. I'm a big fan. It's an Indonesian soy product - basically it's fermented soy beans, compressed into a dense cake. I know this isn't the most enticing description, but it is so delicious! I love it fried, when the crunchy edges contrast against the dense and slightly mealy inside. I got this brand because it was the only one available at my local supermarket, and it turned out pretty good. 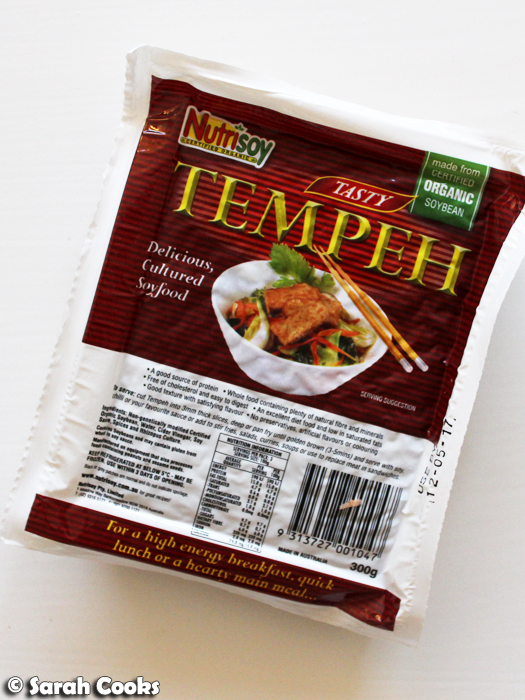 Any recommendations for a good brand of tempeh? Hit me up in the comments. This is what it looks like. There are a few ways to cook it, but I like slicing it into thin slices (about 3-5 millimetres) and frying it. And here are the bowls! I gave the sweet potato my usual treatment of roasting it in cumin and olive oil. For the broccoli, I chopped it into florets, boiled it briefly and then tossed it through a little olive oil with some chilli flakes, salt and pepper. Easy! You see all the elements I have so far are kinda dry, and I wanted something moist to bring it all together. If I were eating this at home, something like a miso soup (vegetable stock rather than dashi if you wanna keep it vegan) or a coconut-milk based curry would be perfect, but I wanted something that would be easy to transport to work without spilling. 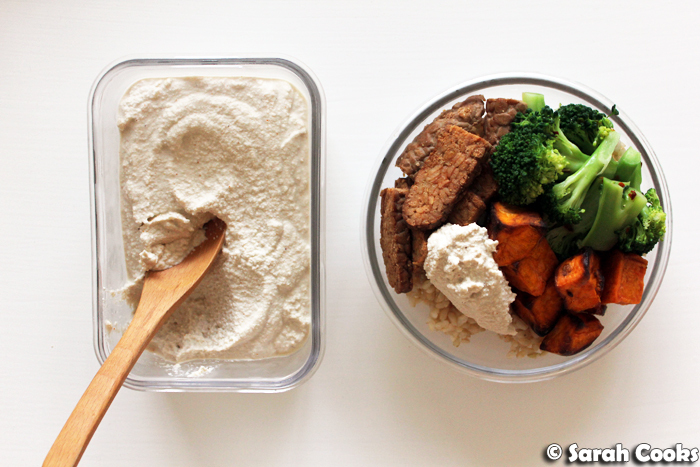 Enter cashew cream. I'd never made a nut-based sauce before, but saw a base recipe for cashew sauce on Pinch of Yum and was immediately intrigued by the idea. You simply soak the cashews to soften them, then blend them with some water, garlic and salt to make a creamy sauce. I used less liquid than Pinch of Yum, making it more of a cream than a sauce - I haz issues with drizzling white liquid over my food - and flavoured it with ginger, soy, lime juice and chilli. Not only is it wonderfully creamy, but the zingy flavours really complement the plain brown rice, and the earthiness of the tempeh and sweet potato. Winner! Here are the recipes! Enjoy. 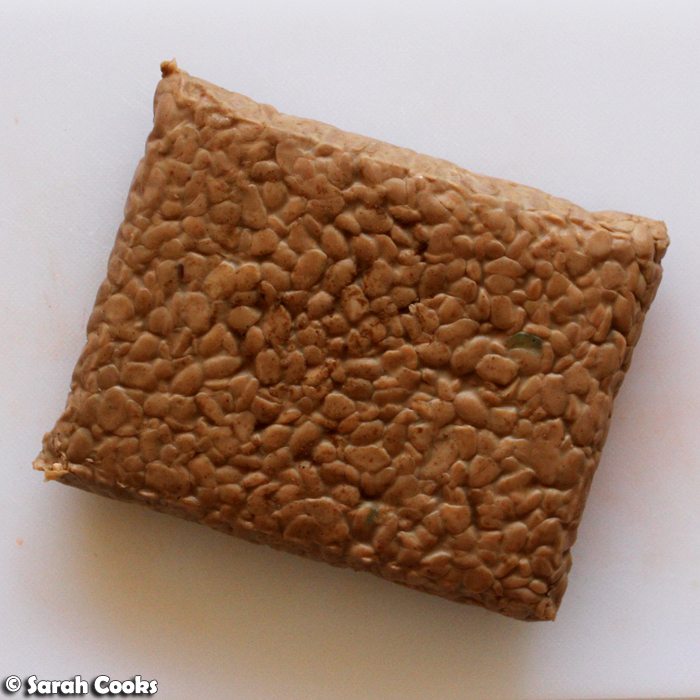 Chop 300 grams tempeh into 3-5 millimetre slices. Heat some vegetable oil in a frying pan over a medium heat. Fry the slices for a minute or so on each side or until golden brown. Drain on kitchen paper. Preheat the oven to 220C. Peel 1 large sweet potato and cut into 2 cm chunks. Drizzle with a little olive oil, and sprinkle with 1/2 teaspoon cumin powder, 1/2 teaspoon cumin seeds, salt and pepper. Place into an oven tray and bake for 15 minutes, or until softened and slightly browned around the edges. Chop one head of broccoli into florets. Put a saucepan of salted water on to boil. Once at a rolling boil, add the broccoli florets. Boil for 2 minutes, or until bright green and tender crisp. Drain the broccoli and rinse under cold water. Drain again. Place the broccoli in a bowl, add 1 teaspoon of extra virgin olive oil, 1 big pinch of chilli flakes and season with salt and pepper. Toss to combine. Place 1 cup cashews in a bowl and cover with water. Soak for 2 hours. Drain and rinse the cashews. Place the soaked cashews in a food processor with 1/2 cup water, a pinch of salt, 1 teaspoon soy sauce, a pinch of chilli powder and the juice of half a lime. Grate in 1 clove garlic and a similar sized piece of ginger. Whizz until all the ingredients are smoothly combined. Taste and add more flavourings to your liking. Add more water if you prefer it thinner. 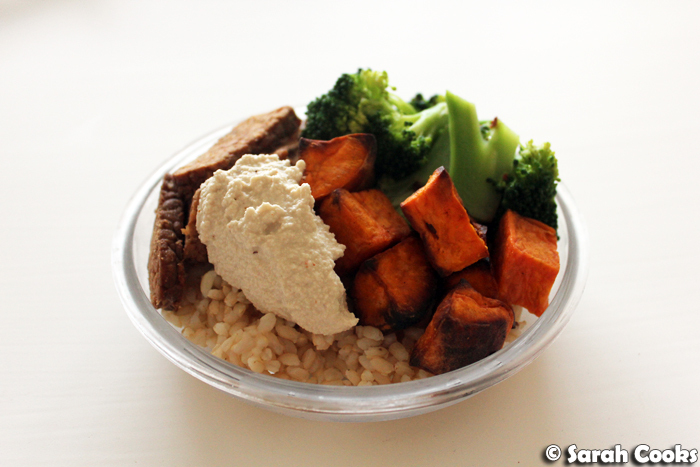 Place 1 cup brown rice and 2 cups water into a saucepan with a tight-fitting lid. (You're supposed to rinse rice before you cook it, but I never do). Bring to the boil over a high heat, then turn the heat to low and clamp on the lid. Cook for 30 minutes. Remove from the heat and allow to sit, covered, for 15 minutes. Remove the lid and stir the rice to fluff it up. Man this makes vegan food sounds so tasty! Hubby grew up on tempeh and doesn't like it but he loves tofu so I'm sure I could sub it!